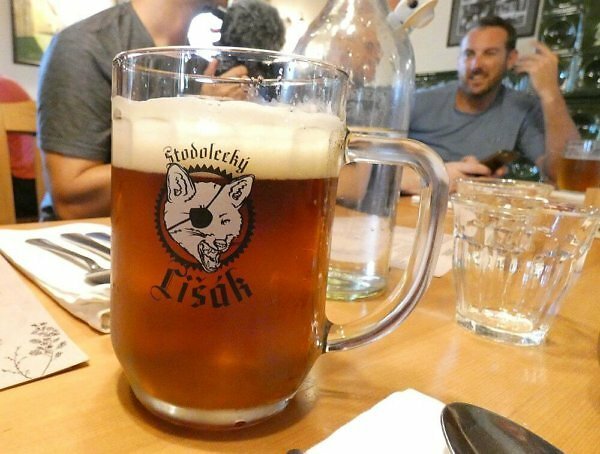 There are plenty of places around the world where you can buy cheap-tasting beer for cheap, but if you want to drink well without spending lots of dollars or euros, head straight to the Czech Republic. There you’ll be in sudsy nirvana. Czech beers are uniformly tasty, without all the shortcuts mass breweries have sunk to in most parts of the world. So even if you walk into a pub and they only have one brand of pivo, it’s probably going to be good. That’ll usually be a pilsner, but in most cases they’ll have something else on offer too, like a dark beer or an amber. You can buy a round of beers for yourself and three friends here and probably not spend what you would on a single 12-ounce craft beer in a U.S. or British city. Prices can get out of whack in touristy Prague, but in most parts of the country you can feel secure ordering what the pub or restaurant is serving customers without looking at the price. Beer is cheaper than soda, coffee, or often even bottled water. A 500 ml large beer will usually be somewhere between 25 and 39 Czech koruna, or in U.S. dollars, $1.10 to $1.70. This is some of the cheapest beer in the world, but also some of the best. That chalkboard pub sign here is from a small town called Krasna Lipa, the gateway to the Bohemian Switzerland National Park that I profiled earlier. As I write this, the exchange rate is US$1 = 22 Czech koruna. Those are “village prices,” not the prices you’ll find in Prague. 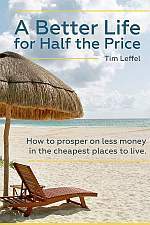 So you’ll have to venture outside the big cities, how many places in the world can you find a half-liter/pint of beer you’re going to really enjoy for $1? 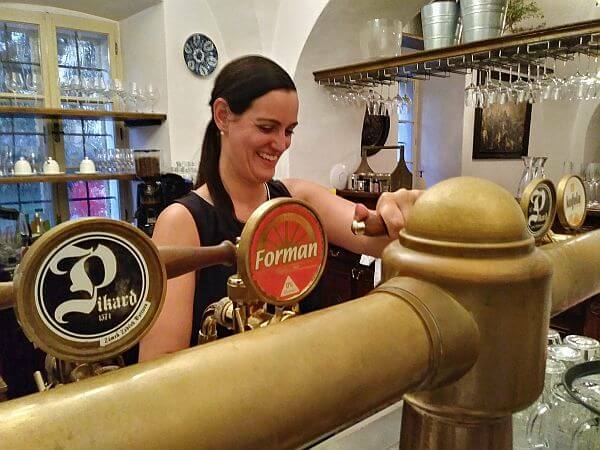 If you’re European, you’ll frequently find one-euro pints. The big name brands of beer in the Czech Republic are known in European countries, in the case of Pilsner Urquell, known around the world. This is the original home of pilsner, after all, with a heritage going back centuries and a town called Pilzen, so they’ve had plenty of time to work on their craft. Unlike the poor substitute with the same name across the Atlantic, the original Budweiser here (Budejovicky Budvar) actually tastes like beer. I did my best to sample all of the major Czech brands while I was in the country this time and was rarely disappointed. In my opinion the heavily marketed Staropramen is the least interesting of the bunch, but you can tour their brewery in Prague, so that’s worth doing if you’ve got the time. Their maltier red beer Velvet is better and looks good in the glass. Pilsner Urquell you’ve probably had before and it’s reliable, but locally their Gambrinus brand might be more popular. Try the unfiltered lager if you get the chance. 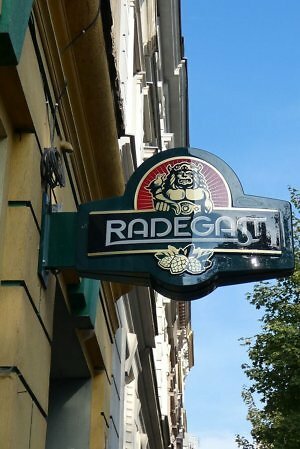 They also own Radegast, which is very popular in the southern part of the country. I probably drank this one the most and never got tired of it. 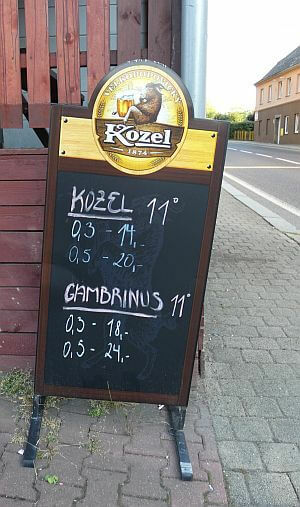 Their Kozel brand is a reliable choice if you like full-flavored beers. The lager style pale one is good, the amber-colored dark and malty one is fantastic. I ordered one in a Czech neighborhood in Prague with dinner and ended up getting two more when I found out they were $1.60 a pint. (Surprisingly though, it’s only 3.8% alcohol.) This brewery has been operating for 144 years, but these are the only two styles they make. Hey, sometimes you just stick with what’s working. 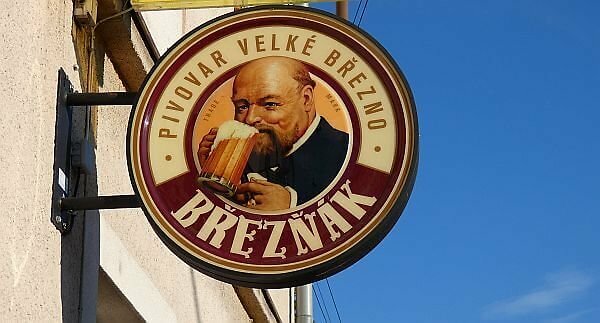 Breznak pilsen is widely available since it’s now owned by Heineken. Czechs have been pouring it since 1753 though, so they’ve been doing something right. If you can find a Bernard beer, which is unpasteurized, don’t pass up the chance to try it. 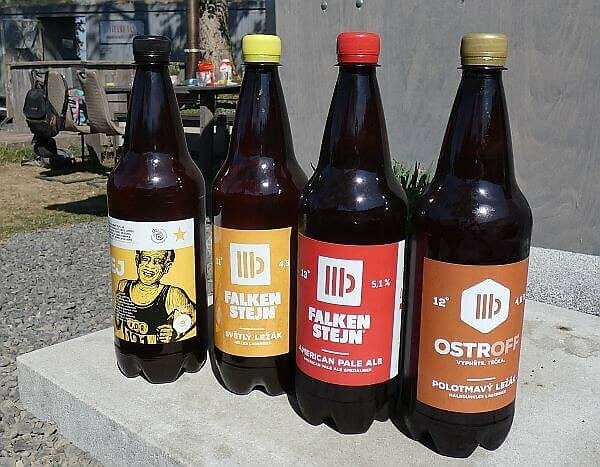 This brewery doesn’t have the long heritage of the others, but it has a partnership with a sizable Dutch brewery and is expanding distribution. There are also some smaller local, but big-volume brands brewed in different regions. like Ostravar from Ostrava. What’s with Those Degree Numbers? Sometimes you’ll see alcohol percentage listed on a can of beer you buy in a store in the Czech Republic, but more often you’ll see a beer designated as 10°, 12°, etc. No, that’s not the temperature of the bar’s cooler, it’s another way to designate the alcohol percentage. So the lower the number, the less alcohol it has. So if you get a 10 degree Czech beer, it will be 4% alcohol, 11 is 4.5%, 12 is 5%. They don’t normally go higher than 14 degrees here (6%) unless you’re at a microbrewery. When I first visited the Czech Republic on a biking trip more than a decade ago, there were very few small breweries in the country making small batches. In a way it’s understandable. since the mass-market beer here is so good, but now it’s possible to get even better beer from brewers who are experimenting. 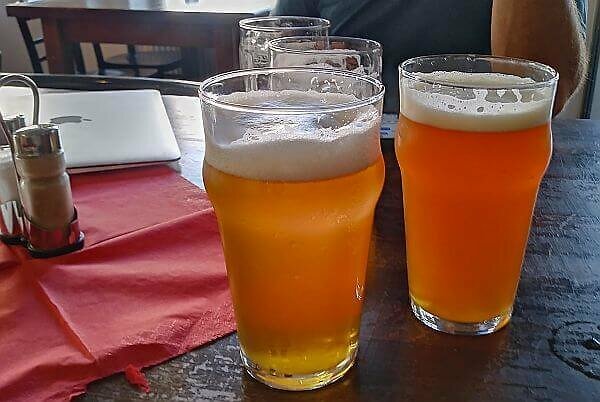 The Prague Tourism office distributes a free brewery guide you can use to find spots in the city with a good selection. Some are part of a restaurant serving traditional food, others seem to be modeled after U.S. brewpubs, with the same kinds of football game pub grub. I checked out a few different ones in the capital, generally paying a lot more for the beer, but still far less than I pay at home: $2.50 to $3.50 for a pint. It seemed kind of silly to order something like an IPA, though you can get that, so I tried a lot of really good malty beers and a wheat beer. As I noted, you should expect to pay more for a microbrew than you will for a commercial brand with wide distribution, but rarely more than double. So if prices in the local pub are running $1.60 for 500 ml, the microbrew will often be $3 (66 krona) or less. Often a lot less. Really though, the best bet is to get out of Prague. Some 80% of visitors never do, so the economics are in your favor once you leave the tourist cocoon of the capital city. Almost anywhere else you’ll pay Czech prices for a beer, which is $1 to $2.20 for a pint in a bar, less than that for 300 ml, and often 40 cents to 80 cents in a supermarket for a 500 ml can. Then drink up. If you can’t finish your beer, get someone else to chug it. Leaving a half-empty glass on the table is considered an insult to the pub or restaurant owner. 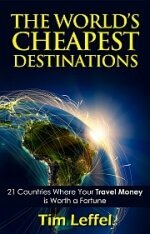 I looked through cheapestdestinationsblog.com and I was wandering if you are open to allow guest-posting or would be interested in advertising inquiries. I am interested in increasing the exposure for my site. Would you be interested to allow guest-posting? Otherwise, do you have any advertising options that I could opt for? Evan Rail, who is the expert on Czech Beer and Breweries, says that Kout na Sumave is the best beer in the Country. He took even took Anthony Bourdain there on his Show when he Toured the Brewery. You can ride the Train from Prague, or from Frankfurt to the town next to the Brewery ad stay in the town of Domazlice and ride the bus to the Brewery. There is a small Beirhall in Domazlice that only serves Kout Beir. The town is a really cool town with a wonderful square and many Fountains, so is worth a visit in its own right. The surrounding area is the famous Sumave Forest, one of the largest forest left in Europe (watch for ticks and wear repellent because of the Lyme). Evan Rail literally, “wrote the book” on Czech Beer & Breweries, it’s by the “Good Beer Guide Series entitled “Prague & the Czech Republic”. It’s a little dated now, but it has led me on numerous beer adventures in Czech Republic over the years. He evan wrote a short story about the Kout Brewery. If you’re riding the train from Prague, you can stop in Pilsn and visit the Pilsener Urquell Brewery. Don’t drink there though, except for the Tour. Instead go to the Brewry affiliated Brewpub & Beer Garden a short walk away. It’s called na Parkane. 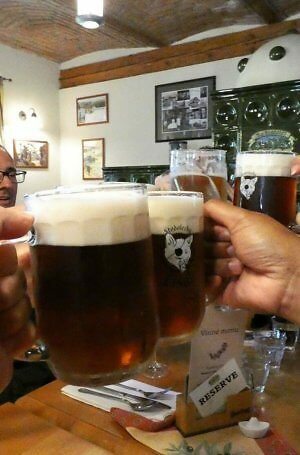 They are the only place in the World to serve Kvasnicovy style Pilsner Urquell. Kvasnicovy is a style of Czech Pilsner that is a Yeast Beer, like a Hefeweizen, but contains no wheat. Remember, pretty much all Czech Beers are Czech Pilseners, no matter what color the Beer because they are fermented with Pilsner Yeast. The degree symbol on the Tap that looks like a temperature is the Balling Scale, which does’t measure alcohol, but instead, measures residual sugars. Some of the best beer is actually the 10 degree. After drinking good Czech Lagers for many years, I am ruined & find the IPA craze in the USA unfathomable. If the Folks over here could drink a real unpasteurized Czech Pilsner, they might come to the same conclusion. Thanks for the tips! I’ll have to check that place out on trip #3. I got the “degrees correlates to alcohol” from two different brewers I met and one bartender. It checked out on the cans I cross-checked in stores where they had both listed. I also drank three microbrews that were not made with pilsner yeast and of course the ales aren’t. Some people like the taste of hoppy beer. It’s a personal preference, just like some people love Scotch whiskey and some love bourbon. Yeah, Tim. It’s all about personal preference. Most Americans just don’t ever make it over to the Czech Lands, so they don’t even get a chance to try a really good Lager Beer. Germany really only has one Region left around Bamberg that still has good traditional small batch Lagers. The “U” Beers, which still come out of the wooden barrels are very good, but, arguably, are still no match for the small brewery Czech Lagers IMO. Thanks for the Article. I really enjoyed it & maybe it will get more Folks motivated to cross the pond & “Czech” it out. Trains are always cheaper in the former Eastern Bloc Countries & for a little money you can ride all over those Countries by train- which is something the average American doesn’t really get to experience any longer. Jut the trains and trolley’s are reason enough to visit. Much less the Castles & Beer. I cannot suffer through one more IPA. If there were a god, she/he would send locusts to the Chinook, Cascade and Citra hop bines and save our collective palates. also one advice about buying beer in a shop ;) Czech people aren’t very fond of cans, because of taste and ecology. So, be like us and buy beer in a glass bottles. You will pay 3czk of deposit. You will get it back in any shop selling this brand. Also, if you are too lazy to return it, let it in your room or leave it next to the bin. Someone is going to return it for sure. Good advice. I’m all for avoiding waste–thanks! A decent all-round article, thanks. In my opinion you have overstated the costs of Prague. Most people reading this will not be scared of paying 40-60czk for a beer which is the price in the old town except all but the worst tourist traps. 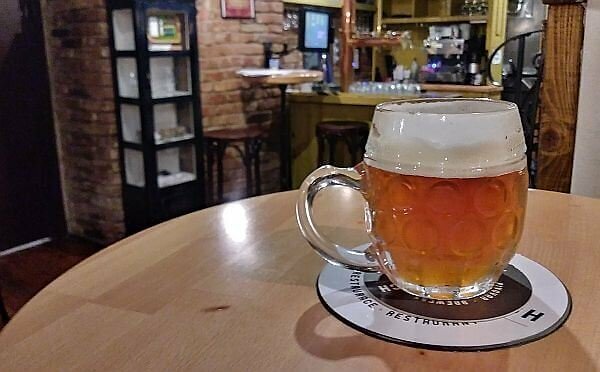 And just as there are tourist traps, there are in-the-know pubs like U Cerneho Vola, U Rotundy, Formanka, Hostomicka Nalevarna, U Prasivka that are 10-15 mins from Charles Bridge where you can drink a half litre of good beer for below 30czk. It is true that out in the country it is more normal to find prices around 25czk (although usually for the lower quality brands like Branik, Breznak, Radegast, Holba, Staropramen, Litovel etc.) But we are quibbling about pennies here. Yeah, I did note that when you get a kilometer or two out of Old Town it’s a different story. It’s worth it to get into real neighborhoods and away from the tour groups. A great value though all around.